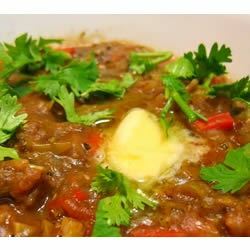 This is a very popular recipe in India, liked by almost everyone. You may have to go to a nearby Asian Indian store to get the 'Pav Bhaji Masala' that is the special spice to bring the flavor (Masala means spice). Pav is actually the buns. 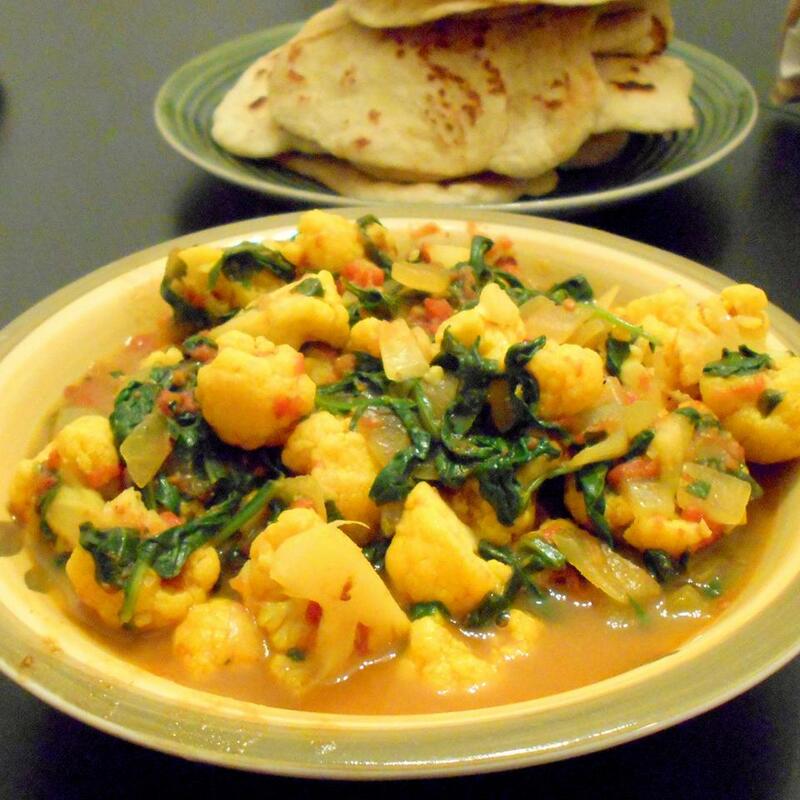 Bhaji is the vegetables cooked with spice. Heat the oil in a wok over medium heat. Saute garlic and green chile for 30 seconds, then stir in onions and ginger. Cook until onions are brown. Add tomatoes, and cook until pasty. Stir in cauliflower, cabbage, peas, carrots and potatoes. Season with pav bhaji masala. Cover, and cook for 15 minutes, stirring occasionally. Season with salt, and stir in lemon juice. Toast the dinner rolls, and spread lightly with butter. Serve garnished with chopped onion, green chile and cilantro. Yummy recipe. I used garam masala instead of Pav Bhaji masala. Taste just as good. Not like the ones you get on streets of India so I asked my Indian friend and she had some suggestions: Substitute cabbage with green beans. Boil carrots potatoes cauliflower peas and green beans beforehand. Saute onions and garlic in butter/vegan butter. Add tomatoes/puree and spice and stir for another minute or 2. Add spice (PB masala) ginger/chillies and freshly chopped cilantro (1 cup) and stir for another minute. Add all pre-cooked lightly mashed veggies salt and lemon juice. Cook on lowest heat for about 10 minutes check seasoning and add lemon juice spice and salt according to taste. Cook on lowest heat for 20 more minutes to allow the flavors to sink in. Viola! Tasted pretty close to what I had on the streets of India! I give this recipe 5 stars because while I didn&apos;t like it I think it&apos;s because I am not use to eating Indian food. It was much too spicy for me. I made this along with the Roomali Roti bread that&apos;s on this site. I had my oldest daughter take the leftovers (there was alot) to the Indian store where I had purchased the spices. They ate it for lunch and said I had made it better than some Indian women could and that it was delicious. So the recipe must be worth 5 stars and tasty to those with the right tastebuds. My family loved this recipe. Our suggestion is that next time we will try warmed wheat pita bread instead of dinner rolls. This dish is great topped with additional fresh chopped roma tomatoes. The prep time was stated as 20 minutes however the chopping of veggies took longer than that. Perhaps the recipe author used a food processor? We found the amount of food to serve more than 4 perhaps 6. I&apos;ve eaten a lot of really great Indian food over the years but this was a welcomed surprise. I didn&apos;t have the energy to seek out the spice mix it called for so I simply mixed together more or less equal parts caraway seeds coriander seed and star anise ground them up and toasted them on the stovetop in a cast iron skillet. I also through in about 1/2 tsp of curry powder and another 1/2 of turmeric. Oh and I added about a tablespoon of tomato paste. Instead of dinner rolls I served it with paratha which I can get frozen at the local intl market. This was awesome. It&apos;s a little much for four servings; it was actually more like five or six. I used a couple of tablespoons of butter instead of the oil and just a couple of teaspoons of the masala. I&apos;m glad I didn&apos;t use any more because it was pretty hot. My husband seemed to like it a lot though. It&apos;s a great way to disguise leftover vegetables! yum yum yum I made this one day ahead of my indian feast to let the flavours marry but you really don&apos;t need to!! I did not serve this with buns but made puri instead. A hit! !